If you google “Donegal Highlands,” you’ll probably discover a website about a golf course west of Lancaster, Pennsylvania. This post isn’t about that. It’s about the short scenic route between Carrigart and Letterkenny in County Donegal that takes you through some lovely mountainous terrain. 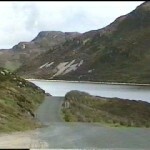 Driving route R245 southwest from Carrigart, you will reach a fork in the road. Take the left road to Glen which puts you on route L1192. 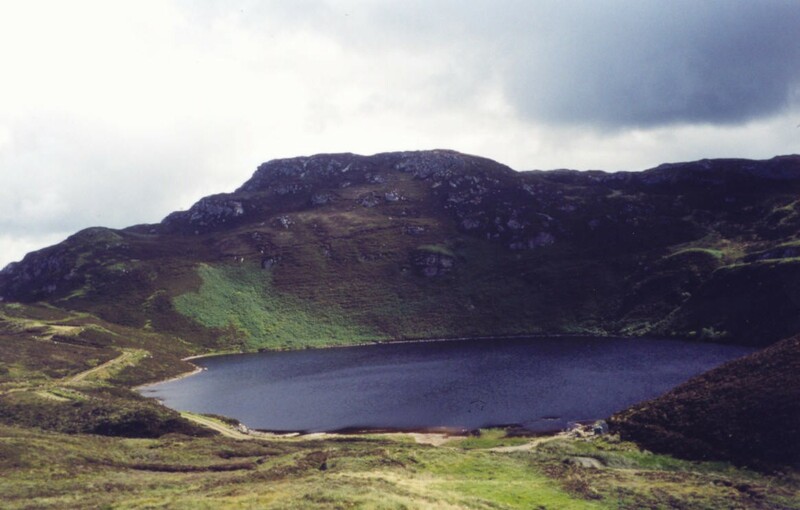 Stay on L1192 past Glen and the road rises in altitude and parallels the great body of water known as Glen Lough. 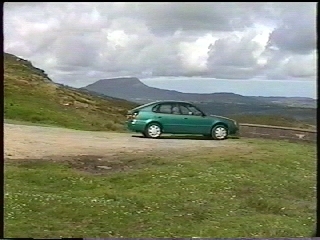 The village of Carrigart and Sheephaven Bay are visible from these heights, as well as the two major mountains of the Derryveagh chain in central Donegal, Muckish Mountain and Mount Errigal. 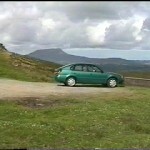 There are many taller mountains in Ireland but these are Donegal’s own. 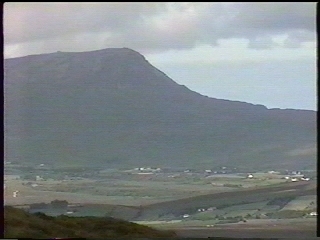 Muckish Mountain (meaning “the pig’s back“) is a distinctive flat topped mountain that can be seen from all over in the area north of Letterkenny. At times, clouds can be seen rolling down the sides of the mountain. It is 2,185 feet (666 metres) in height. 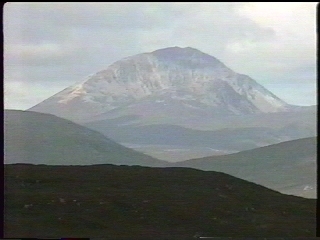 In the distance, Mount Errigal (meaning “oratory”) is visible with its distinctive sides of quartzite. 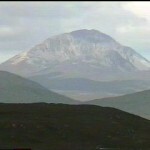 It is the tallest mountain in Donegal at 2,464 feet (751 metres). 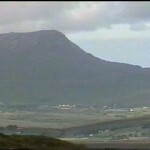 Both Muckish and Errigal are popular for hiking and climbing. 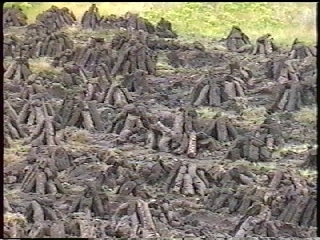 Several fields of bog are located here in the mountains where turf is cut, dried, and bagged. Next, one comes to the lovely Lough Reelan, a jewel of a lake cupped in the highlands. 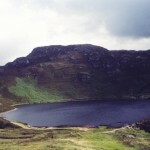 A little farther, there is Lough Salt. 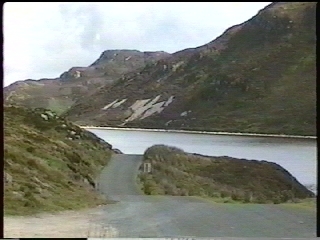 Past Lough Salt, you have a choice of turning right on L5542 which goes to N56 (the main road to Letterkenny) at Termon, or continuing on L1192 (not recommended) to N56 at Kilmacrenan. 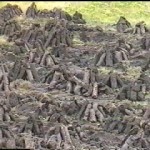 Turf drying in the mountains. Dolmens are stone age portal tombs comprised of a flat capstone supported by two or more upright stones. It is believed that they were covered by earth or small stones after they were built, creating a cave for interment of the deceased. After centuries, the covering eroded away creating the structure we now see. There are about 190 dolmens in Ireland. Most were constructed during the Neolithic Period (4000 – 2500 BC). The day I chose for visiting the dolmen in the Fanad peninsula of County Donegal was a poor one. Not only was it pouring rain, but it was the day the Donegal Road Rally was passing through Fanad, and many roads were closed. 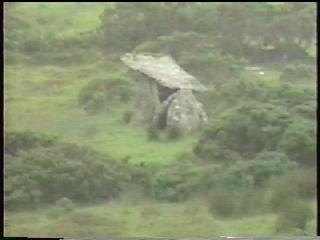 The dolmen in Fanad is just south of Kerrykeel (Carrowkeel). Still I made my way to Kerrykeel and followed directions to the dolmen. I saw it at a distance in a field with grazing sheep near Gortnaven and drove up a dirt (muddy) path to get close. Soon the dirt path turned to a path of large jagged rocks. I picked my way up so as not to scrape the undercarriage of my car or puncture my tires. Eventually I could go no further and had to stop. 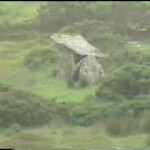 When I got out in the pouring rain to see if the car was damaged, I noticed the dolmen was still far away to the right. The best I could do was take a video of it using the zoom feature. The photo shown is a still from my video.